If you are interested in organising a EURO-k Conference read these guidelines carefully and contact the EURO Vice President 1 ([email protected]) who will advise and monitor the process. EURO-k conferences are hosted by EURO member societies. Proposals for organising EURO-k conferences are approved by the EURO Council. Most of the affairs related to EURO-k conferences are handled by the Organising Committee (OC) and the Programme Committee (PC). The OC is responsible for running all organising issues. It is chaired by a local person and member of the organising Member Society. This society decides on the structure and membership of the OC. All scientific matters of a EURO-k Conference are handled by the PC. The Programme Committee (PC) is chaired by a person appointed by the EURO Council, on the nomination of the EURO Executive Committee, coming from a different country to that in which the conference is organised. All other members of the PC are nominated by the PC Chair and must be approved by the EURO Executive Committee (EC). The Chairs of the OC and the PC shall maintain close cooperation with the EURO Vice President 1 and between them. EURO-k conferences feature some special events, including the opening and closing sessions which should be structured as plenary sessions by mutual consent of the OC, PC, and the EC. The opening session should give EURO and the host member society the opportunity to present themselves to the public. Thus the PC and OC Chairs of the conference, the President of the national OR society and the EURO President may use the opportunity to address the audience in the opening and closing sessions. The presentation of the Distinguished Service Medal Award (EDSM), the Gold Medal (EGM) and the accompanying lecture of the Gold Medal laureate are scheduled as a plenary session within the opening session. In the closing session, organisers of future EURO-k and IFORS events are also given the opportunity to announce their meetings. For the presentation of other prizes, the following plan is typically implemented: the presentation of the EURO Excellence in Practice Award (EEPA) finalists and the presentation of EURO Doctoral Dissertation Award (EDDA) finalists are scheduled as parallel sessions. 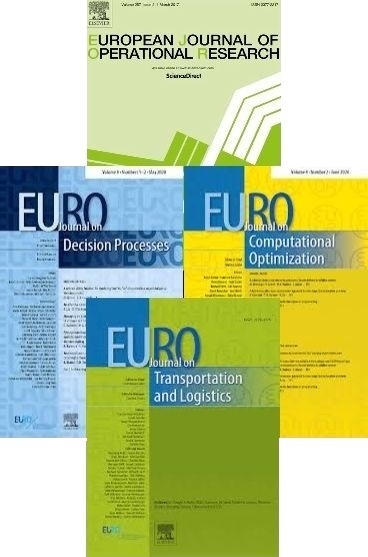 These prizes are awarded to the winner(s) during the closing session along with the winners of the EURO Award for the Best EJOR Papers (EABEP). Student-focused activities e.g., job placement opportunities. Please contact the EURO Vice President 1 ([email protected]) for further details. The site of a EURO-k Conference may be a suitable place in the country of a EURO Member Society. Costs should be kept as low as possible. For this, the conference is usually held in a university or an institution providing meeting rooms at minimum or no charge. The conference usually takes place in summer during the first half of July. Both the site and time of a EURO-k Conference are proposed by the organising Member Society. If another organisation, e.g., INFORMS, is to be involved as well, special protocols (to be endorsed by the EURO Council) have to be used. The Organising Committee (OC) is chaired by a local person and member of the organising Member Society. The OC is responsible for running all organising affairs. The OC includes among its members the Chair of the Programme Committee (PC), EURO Manager, and EURO Vice President 1. The Chair of the OC shall maintain close cooperation with the EURO Vice President 1 and the Chair of the Prgramme Committee (PC), which is responsible for all scientific matters related to a EURO-k Conference. The Programme Committee (PC) is chaired by a person appointed by the EURO Council, on the nomination of the EURO Executive Committee, coming from a different country to that in which the conference is organised. Other organisational costs (mailing, secretariat, etc.). The conference accounts have to be audited by an auditor appointed by EURO; typically the EURO Treasurer. The costs of the audit will be covered by EURO. Use of Professional Conference Organisers (PCOs) may be advisable, if the size of the conference is expected to be very large, In order to minimise cost, the ex officio members do not, in general, attend meetings of the OC but receive papers and provide advice. The Organising Committee (OC) is chaired by a local person and member of the organising Member Society. The OC includes among its members the Chair of the Programme Committee (PC), EURO Manager, and EURO Vice President 1. The Chair of the OC shall maintain close cooperation with the EURO Vice President 1 and the Chair of the Programme Committee (PC). At least every three months the Chair of the OC will present to the EURO Vice President 1 a brief report on the status and the current activities concerning the preparation of the conference. Not later than six months after the conference the Chair of the OC shall present to the EURO Council a report to be put on the EURO website regarding the organisation of the conference. They shall also provide a financial report and updated budget to the EURO Vice President 1 in advance of each relevant EURO Executive Committee meeting (Jan/Jul) before the Conference, with a further report prepared by the start of the Conference. The final financial report shall be submitted not later than six months after the Conference. EURO provides a list of conference participants for which it will pay the registraton fees (at the early registration rates). The speakers at the plenary and semi-plenary sessions, members of the Programme Committee (PC) and Organising Committee (OC) are excluded from paying the registration fees (covered by the conference budget). Students pay a reduced fee. EURO provides a loan of 10,000 € to the OC to cover the costs incurred before registration fees come in. The loan of 10,000 € is converted into a support of 10,000 € to meet the registration fees of participants from Eastern and Central Europe (weak currency countries) at the early registration rates. The decision on how to allocate this money is exclusive to the OC. The organising Member Society will remunerate EURO by paying a fee of 20 € per regular participant and 10 € per student participant to cover the required contribution to overheads as well as the use of the EURO Electronic Conference Abstract Submission System. In general, all other profits and losses would be shared equally (50% / 50%) between EURO and the host society. The host society may request different percentages in negotiation with EURO. The system of payment of abstract deposits and registration fees and the location of the bank accounts receiving these fees are chosen by the OC after consultation with the EURO Treasurer. Payment via all major credit cards must be accepted and clearly announced. A final budget must be submitted to and approved by the EURO Executive Committee at least 12 months before the conference. Initial and final budgets should present the development of the relevant positions for a low, medium and high level of attendance. Significant changes between the initial and the final budget - in particular with respect to the conference fees - should be convincingly motivated and agreed to by the EURO Executive Committee. The EURO conference system is used for abstract submission and producing the scientific programme (and typically it should be linked to conference registration). The integrated EURO database should be used for communication with all participants. It is requested that all the abstracts be delivered electronically through the conference system which helps the PC schedule streams and sessions easily. Since conference websites provide visibility and are an important means of communication with potential participants, it is recommended that the website containing basic information be made operational two years before the conference by the local organisers. The website should preferably be hosted on the EURO server. Over time, the website is gradually improved by adding new information about the conference and later the possibility to submit abstracts and register. It is recommended to sustain a close contact with potential participants and to inform them about conference activities and dates by sending e-mails whenever it is appropriate. In order to increase the number and quality of presentations, it is important to announce the conference early enough in an effective manner so as to create wide awareness in the global scientific community. The major task in an dissemination plan is to determine the proper timing and content of announcements. Usually preliminary announcements are prepared two years before the conference and calls for papers are prepared one year before the conference. They are distributed at different related conferences, mailed to EURO member societies, EURO Working groups, and universities. Posters are usually printed and mailed to different conference sites and universities as well. Electronic copies of these are made available on the EURO, and conference web-sites. The impact of personal efforts and personal contacs with key researchers should be considered as an important factor in increasing participation. Not later than six months after the conference the Chair of the OC shall present to the EURO Council a report to be put on the EURO website regarding the organisation of the conference. The final financial report shall be submitted not later than six months after the Conference. The omission of providing the registration information within three months, the omission of providing access to the Conference accounts and the final reports within six months allows EURO to apply large legal penalties to the due funds. Any controversy will be regulated where EURO is officially registered. EURO Vice president 1 prepares a formal agreement based on the above guidelines which is signed by the EURO President and Secretary, a representative of the organising Member Society and the Chairs of the Organising and Programme Committees at least one year before the conference. When signing this agreement the chairs of OC and PC should consider these guidelines as the basis of their commitment. The organisers are advised to monitor the process closely and extend these dates whenever necessary depending on the response from the scientific community and global economic and socio-political factors. All scientific matters related to a EURO-k Conference are regulated by the PC. The Chair of the PC shall maintain close cooperation with the EURO Vice President 1 and the Chair of the OC. The Programme Committee (PC) is chaired by a person appointed by the EURO Council, on the nomination of the EURO Executive Committee, coming from a different country to that in which the conference is organised. All other members of the PC are appointed by the EURO Executive Committee. All possible modifications are permitted with the consent of the EURO Executive Committee. The Chair of the Programme Committee (PC) will be supported in pursuing their responsibilities by the members of the Programme Committee (PC). Each member of the PC is assigned a set of keywords and asked to invite scientists to organise streams and sessions in those keywords. A stream is usually defined to contain at least a given number of sessions within a thematic area. In its turn, each session usually will include four presentations (at least three). The degree of flexibility and the coordination among the stream organisers, session organisers, and PC members is at the authority of the PC and to be executed according to the joint decision of the PC members. The organisers of the Making an Impact and OR Education streams will be suggested by the EURO Executive Committee. The PC members may empower the stream organisers to invite and accept presentations and to organise their invited sessions subject to their approval. Contributed paper presentations are welcomed and processed by the PC. Once they are accepted, either they are assigned to the right invited session in coordination with the related stream organiser or they are assigned to contributed sessions. The willingness and dedication of stream organisers play an important role in increasing participation and decreasing no-shows. A second meeting to finalise the Programme.